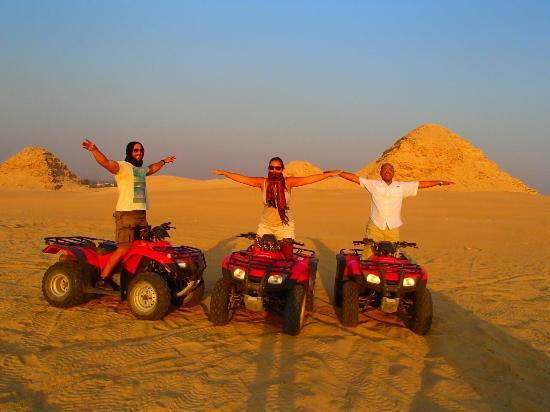 Desert Safari by Quad Bike Around Pyramids to starts, your guide will give you full attention. Once in the car, your guide will talk to you about all the things on the way as well as other aspects of your tour that will interest you. Enjoy the only place in Egypt where you can experience the wonders of the ancient world through the quad bike tour Desert Safari by Quad Bike Around Pyramids experience with a panoramic view of the Pyramids of Cheops, Chephren and Mykerinus. Start Your tour with EgypttravelccTour guide will be waiting you. They will be holding a sign of Egypttravelcc tours , You do not need to look for them – they will be waiting for you and will find you. What is unique about this tour is getting there is half the fun, Being there near the great pyramids of Giza and the Sphinx enjoying the adventure of quad bike. Entry visa to Egypt (We can provide you with your visa upon arrival at your request).